98.5 to 02 Dodge Cummins 24V The factory spill bottle location makes a MESS of the engine. Relocate the mess off the motor. 2. Three 1 1/4 inch all stainless hose clamps. 3. One 2 inch all stainless hose clamp silver soldered to a cut down,trimmed and drilled bracket. 4. One 1/4 inch bolt, lock nut and washer. 5. One lathe turned Super Tough PVDF 3/4 inch tee (not cheap plumbing plastic). 6. Two different mil. spec. Buna – N Rubber Grommets (one spun ground to fit the fill cap). 7. One lathe turned filtered oil vent cap. 8. One lathe turned replacement engine oil fill cap. The only thing you will need is 6 foot, 4 inches of hose. $45.00 with free Priority Mail shipping to the lower 48. 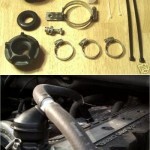 5 fitting set Including Cummins Washers. 98.5 to 02 Dodge Cummins 24V. 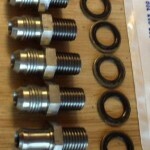 These fittings will allow you to replace ALL 5 of the factory banjo bolts with these steel straight -6AN fittings. These will Increase Fuel Flow and Prolong the life of your VP44.